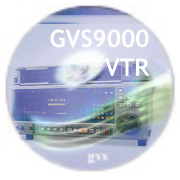 GVS9000 VTR machine control, connect a 9-pin RS-422 cable directly to the 9-pin connector on the back of the machine, all the connectivity on back of unit with HD, SD, Analog, DVI and HDMI, optional fiber optic connection available. 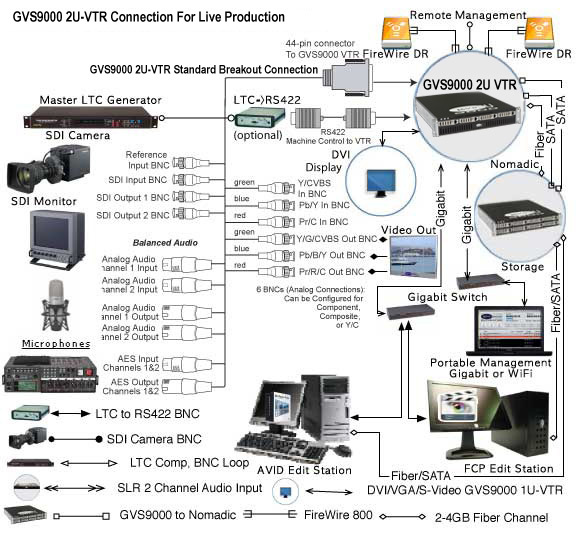 The Alpha Channel powerful hardware downstream keyer can place graphic files with an alpha channel over the video being input to the GVS9000 VTR—or a selectable color matte, or the contents of the GVS9000 VTR frame buffer. The downstream keyer can also key a QuickTime video clip that has an alpha channel by playing it in real-time, via the supplied GVS TV Tools, over live video coming into the GVS9000 VTR.